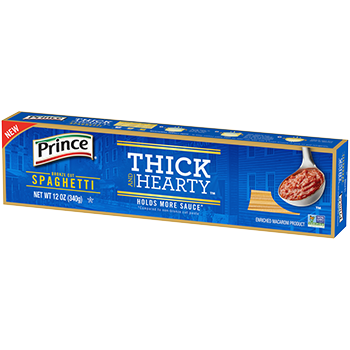 Bring your chunkiest, boldest sauce and favorite ingredients to life with Prince® Thick and Hearty™ pasta. Our Thick and Hearty spaghetti is thick cut with a bronze die, making it more satisfying*; it hugs your pasta sauce, instead of leaving it behind. 2. ADD PASTA to boiling water. Cook uncovered, stirring occasionally. Cook for 12 to 14 minutes.